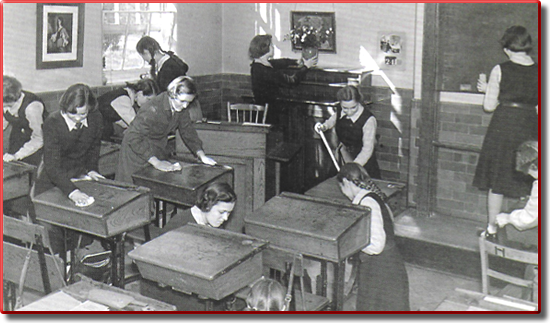 Polishing your desk and cleaning the form-room at the end of the school term. The last day of term was always a half day. No lessons - it was the time for cleaning the form room. On the penultimate day you would have taken books home and packed your bag with polish and a dusterto help in the big clean-up.... you also would have been asked to bring in a reading book - you needed to have something to do if you finished your cleaning jobs early! The form-room would smell of lavender and beeswax - in fact the whole school did! The neatness monitress would check all of the desks and if everything was okay you would then be allowed to chat quietly or read - depending on your form mistress' wishes.